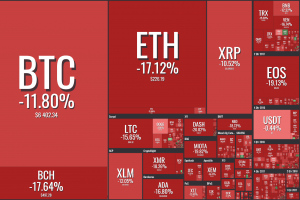 If you haven’t checked cryptocurrency prices in the past 24 hours, you’re in for a shock: the market as a whole is down, many coins having lost at least 10%, but most of them often double than that. At the time of writing, out of the top 100 coins by market capitalization, even stablecoins have taken a nosedive. The community is struggling to explain this uncharacteristic phenomenon. A few main theories took hold of the community: the first is that the drop happened because of the news that Goldman Sachs is ditching plans for crypto. The second is that Bitcoin was being dumped on several cryptocurrency exchanges, most notably BitMEX. The third - and most prevailing one - is that this is simple market manipulation. Also, others are discussing whether it might be a bull trap, or a false signal indicating that a declining trend in a price of an asset has reversed and is heading upwards when, in fact, the price will continue to decline. The manipulation theory brought out some interesting ideas: Twitter user @bechokoy_betts argues that “this is why decentralized markets don’t work in a sense.” Others argue that the volatility has nothing to do with decentralization, but that this volatility will drive out any possibility of a bitcoin-based exchange traded fund (ETF) approval soon. “How can we ever grow as a community or prove to the SEC [The U.S. Securities and Exchange Commission] or anyone the crypto market is safe? Think what you want, today’s drop is clearly market manipulation,” writes Reddit user u/cryptocrew72. However, the Reddit community is not so easily persuaded: user u/mrcartel708 simply says, “If you can’t take the heat, get out of the kitchen,” to the approval of many others. Still, everyone is a little uneasy in the face of the upcoming bitcoin ETF decision. This is where the theory about the Goldman Sachs decision comes into play: many believe that the market’s steep fall is in response to that, and that Wall Street is giving up on crypto. CNBC Television talked to experts about what Bitcoin’s next catalyst and whether the ETF still has a chance of happening. The biggest problem for Goldman, they say, is the fact that it would be hard for them to get institutional investors on board with crypto integration. Meanwhile, Stephen Innes, head of trading for Asia Pacific at Oanda Corp., told Bloomberg that a lot of retail investors’ hopes for a bigger institutional presence were really being driven by Goldman Sachs: “This is just a negative, negative sign as far as liquidity goes.” According to him, the next key level to watch for Bitcoin is USD 5,000, while a drop below that threshold may cause losses to accelerate. The second theory about crypto, especially Bitcoin, being dumped is the one that ties into both of the previous ones: no matter which reason initially brought the prices down, the dump likely followed as a result of panic selling, the community believes. However, those in favor of the manipulation theory believe that even the news of Goldman surfaced just in time to hide a dump by a whale, instead leaving the community to blame the market drop on Wall Street. Whatever the reason for the red market, people would like to know where the decline ends and whether brighter days can be expected. One of the most popular ways in traditional trading is through technical analysis (TA). TA is like handing over your Autonomous car control based on the car's rear cameras. Other than just poking fun at the mental image of analysts scrambling around and trying to make sense of charts and graphs, the community is coming together through their sense of humor as well. 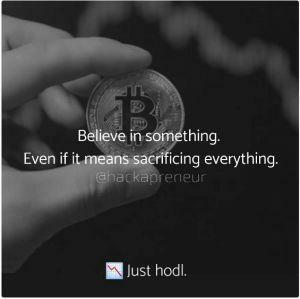 “Believe in something. Even if it means sacrificing everything,” has become the new unofficial motto of the current drop - an appropriation of the recent controversial Nike ad that featured Colin Kaepernick, an American football player, and sparked a heated debate in the US. Another example is this gif, which pretty much sums up the state of the market right now. Meanwhile, Tuur Demeester, a popular economist and bitcoin-investor, took a chance on Twitter to remind his previous forecast that new highs for bitcoin are unlikely this year. On a brighter note: the internet’s favorite joke crypto, Dogecoin, has overtaken OmiseGO and is currently the 21st coin by market cap. DOGE has lost relatively little: “only” 4.45%. Here for the tech, then for the money and finally for the drama. The Usual Suspects: Who just brought my bitcoin down? !